As a general rule of thumb, I find that anything science-related which makes me shout ‘squeee’ may be something about which I should consider posting. And so, today, I thought I’d share just such a thing. The European Space Agency (ESA) has just released our best map yet of the earth’s gravity, in the form of a ‘geoid’*: what the surface of our ocean might look like under the influence solely of gravity, without the influence of pesky tides and currents. 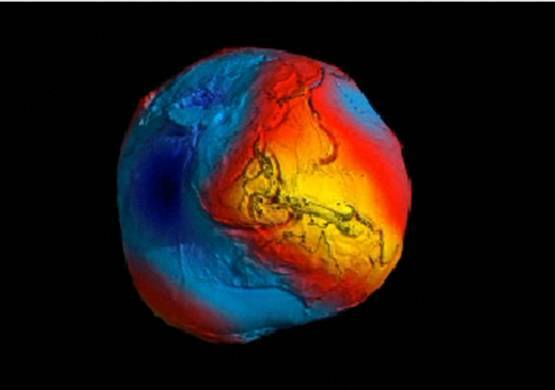 The data used to generate this geoid has been collected over the past two years by the GOCE satellite**, which orbits at about 250km high (this is considered veeery low) in order to get the strongest gravity signal it can from the earth. Apparently, such models are extremely useful, for example for better understanding ocean dynamics such as sea level change, ocean circulation and ice changes. It could also be used to improve our understanding of the causes of earthquakes (think March 11, Tohoku, if you’re wondering why this is important). * Nope, the literal translation is not ‘spinning sphere of joy’. Although one might be tempted to think so. ** Which, awesomely, uses an ion thruster. Phwoar.